Yesterday, I decided to try making the Artisan Bread with only four ingredients. I learned about this bread from Debbie at Stitchin' Therapy. The recipe is here. This bread is surprisingly easy although I think the author left out a bit of the instructions that she assumed most bakers would know. I mixed the dough using the exact ingredients on the list. My dough was almost soupy. So, having baked bread years ago, I added flour to get it to the "shaggy dough" stage. (I probably should have added a bit more. ) Here is what I think she forgot to tell us: The recipe calls for 1 1/2 cups of water. However, flour varies because of many things. Also your altitude, weather and probably something else I am forgetting can affect the dough. So, add the water in stages. Next time I will start with one cup of water and stir, then gradually add water until I get the "shaggy dough" that is needed. My dough rose beautifully. After 5 hours it was almost doubled. There is no before picture (sorry) but this is my large mixing bowl and it is almost to the top of it. Before rising it was a little less than half full. This was allowed to rise/stay in the bowl for 8 hours. I confess that I baked this for supper with a beef dish that I improvised. I was cooking supper for a friend and forgot to get a finished photo of the bread - and, well, we ate almost all of it. I didn't have a Dutch oven, so I used a cookie sheet lined with parchment. I placed two small metal containers with water in them to create steam while it was baking. The crust was very crisp and chewy. It stood up nicely to being soaked in the meat juices and retaining a crunch. I am proclaiming this a win! Meanwhile, the coins quilt hit a snag yesterday. I pulled out my gray fabric and realize that it is just under two yards. 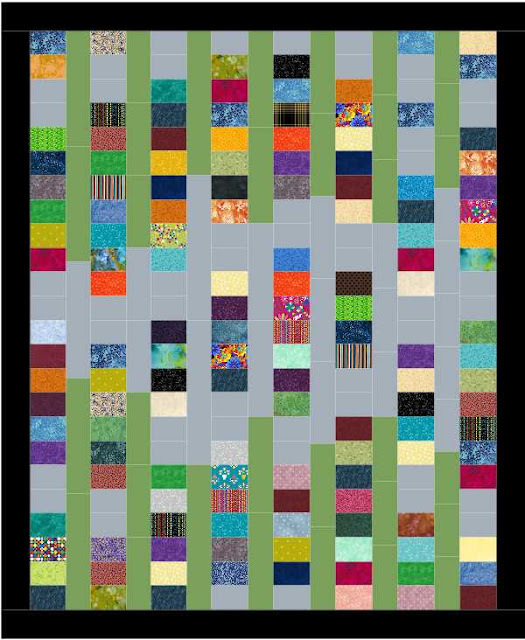 According to Electric Quilt 7, I would need just over 4 yards to make it with the previous plan. So, early this morning I sat at EQ7 and played with an idea that I couldn't figure out earlier. I realized that I could make the solid gray divider strips into "pieced strips" in EQ7 and use one color at the top and the gray at the bottom. I played with the idea and added color at the top and bottom. The green is close to a solid green that I have in my stash. Oh yes, this is a fun plan! My finished product will not match this, but it will be similar and will really be fun. Of course this totally messes up my plan for making the quilt in sections and joining it together. Now what will I do????? First congrats again on the bread. Yes, with our summer humidity in the south, less water would be a help. Your input about stirring with less stil it is shaggy is good idea. New quilt plan...love the variation!! It will come together nicely. As for quilting, so for simple straight line quilting or just wavy lines down or across. It will work perfect on this style design. 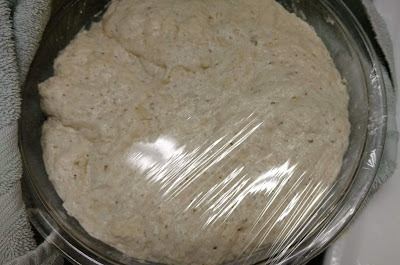 Great looking bread dough! What actually is “artisan” bread? That term is popping up everywhere, even on shop signs. It puzzles me, all andmade bread is artisan in my mind. Your quilt will respond in the end to “what if” for sure! Your coins are looking good. Counting up lol. I have had absolutely NO luck with baking bread in south FL. I believe the humidity has a lot to do with it. The green works perfect in the coins quilt. Great job, Gene.